History is often the account of great events and broad social movements. But, James Srodes, author of On Dupont Circle, has a slightly different approach to examining the genre: “Anyone who reads much history has to be struck by how there are so few really important people involved in any great event.” Thus Srodes examines the intertwining of the lives of thirteen significant individuals who came to Washington, DC, on the eve of World War I and stayed active in politics and government through World War II to seriously impact the world as it exists today. Dupont Circle is a busy traffic circle at the confluence of Massachusetts and Connecticut Avenues in Northwest Washington. In its central green space, folks have been known to sit and play chess while others have dealt in illegal substances. 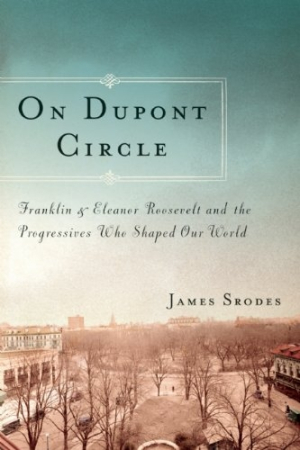 At the beginning of the second decade of the twentieth century, the neighborhood around Dupont Circle was the gathering spot for the thirteen characters who are the subject of this book: Franklin D. Roosevelt, Eleanor Roosevelt, Herbert Hoover, Walter Lippmann, Felix Frankfurter, John Foster Dulles, Allen W. Dulles, Eleanor Lansing Dulles, William C. Bullitt, Sumner Welles, Philip Kerr, Lord Eustace Percy, and Hamilton Fish Armstrong. These men and women who called themselves “Progressives” were educated at elite universities. They believed that they could apply rational thought and a scientific approach to resolve major social issues. Most importantly, the Progressives were dedicated to finding a way to end the threat of war. Srodes argues they believed “The increasing prospect of a major war between alliances of great powers spreading into a global conflict threatened the very existence of civilization.” Thus, their first efforts were directed in support of Woodrow Wilson and his fight to establish the League of Nations. The Progressives’ commitment to world peace was rewarded with the creation of the United Nations after World War II. Srodes has penned an intimate peek inside the lives of these people as they struggled with the great issues of their day and with their ever-changing personal lives. These thirteen gathered in Washington at a boarding house just off of Dupont Circle known as the House of Truth. Here these talented and gifted young people drank, ate, and argued politics, history, and philosophy. They also engaged in romance and all the other idylls of the young, elite, and adventuresome. In addition to Franklin D. Roosevelt, the extraordinary group Srodes examines includes Walter Lippmann, founding editor of the New Republic magazine; future Supreme Court justice Felix Frankfurter; John Foster Dulles, future Secretary of State; and his brother, Allen Dulles, one of the founders of the CIA. Srodes’s On Dupont Circle is a well-researched and well-written compact history that turns distant historical figures into real people.